A letter of interest, also referred to as an inquiry letter or cold contact letter allows you to contact a prospective employer to express your interest, share your information and learn whether they are currently hiring. Your letter should hit several key points. First, you should explain the purpose of your letter. Tell the employer why you are the right person for the job, should they have an opening. Close by requesting an interview and, of course, be polite and professional throughout. If you’d rather not create your letter from scratch, you can use one of these letter of interest/inquiry templates. You can download one or more of the templates and modify the format them to suit your needs. All of these templates are for Microsoft Word and are in .dotx format. They are compatible with Word 2007, 2010 or 2013 as well as Word 2003 provided you have installed the Office Compatibility Pack. This template can be modified and used for any type of job or organization. The template includes address blocks for your information as well as the business’s. Rich text content controls are used, so you can type directly over the sample text. A date field automatically enters the current date, as well. 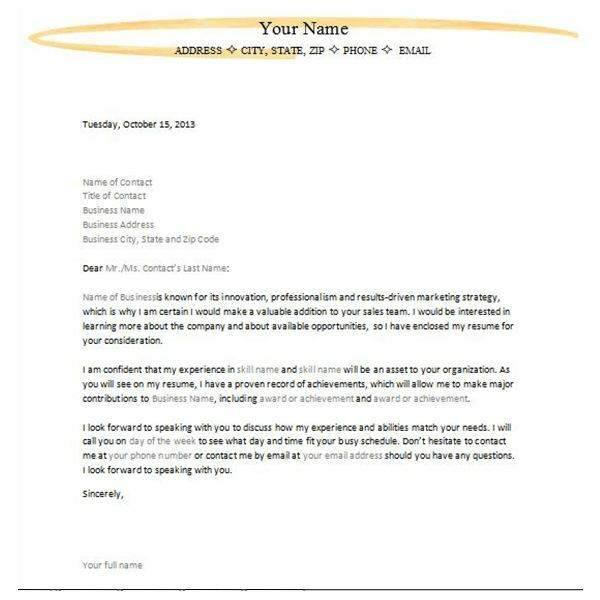 Replace the remaining fields throughout the letter with your information, such as the type of position you seek, your skills and your contact information. 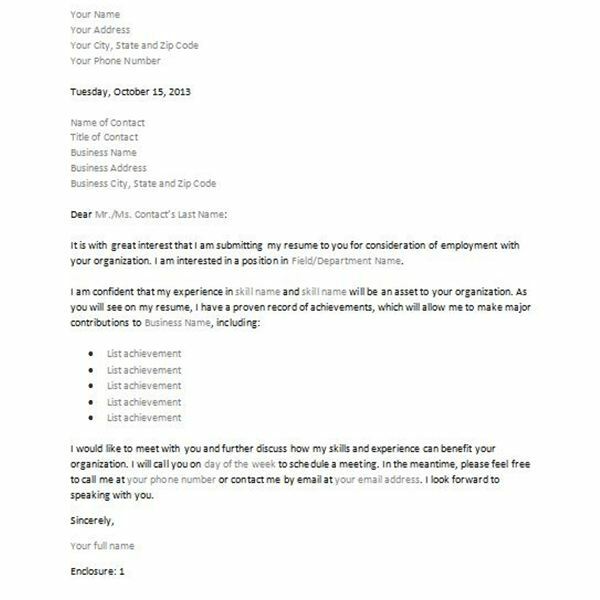 In addition, you can further customize this letter by including details regarding why you want to work for the organization. 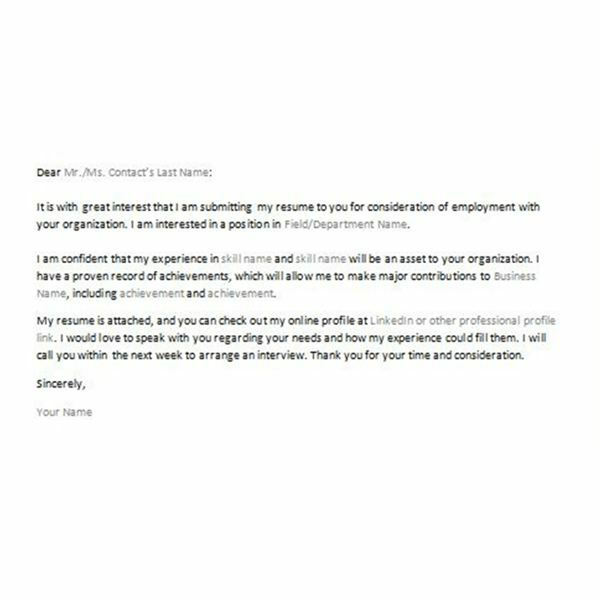 If you prefer to contact potential employers via email, you may prefer this template. This abbreviated version of the general letter of interest template also uses content controls, making it easy for you to add your personal information. Once you complete this letter, you can copy and paste the text into a new email. Simply press Ctrl-A to select the text, press Ctrl-C to copy it and then Ctrl-V to paste it into the email. When you work in sales and marketing, you know that first, you must sell yourself. This template will help you do that. The template includes an eye-catching letterhead, which is in the header. To access and change the letterhead, select the Insert tab, choose Header and select Edit Header. Just below the letterhead is a date field, which updates to the current day and date. Next is an address block, into which you can type the organization’s contact information, followed by a salutation for you to modify with the appropriate contact person’s name. Customize the letter with details on what would make you a valuable addition to the company’s sales team as well as your contact details. 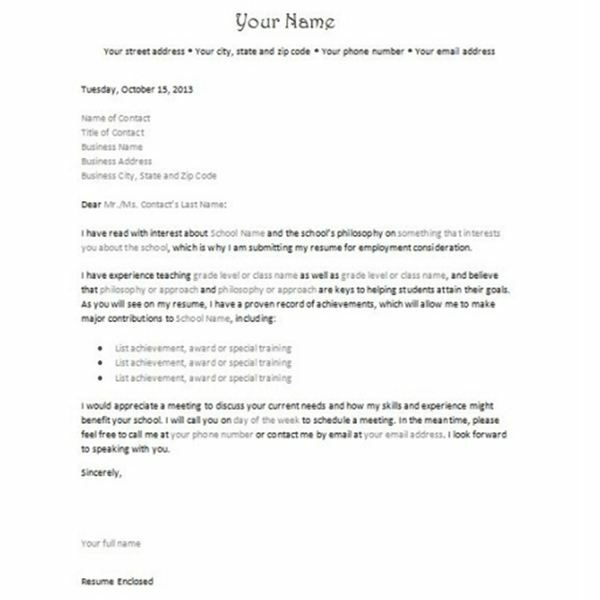 Like the sales position letter of interest, this template includes a simple yet interesting letterhead to which you can add your name and contact information by accessing the header. Tailor the letter to your needs by adding details about the school, your experience and your achievements or special training. Any of these templates can be modified for any type of position. For instance, if you like the letterhead of the teaching letter of inquiry, you can change the body text to better fit your experience. Career Planning & Development: Articles & Tips on Writing a Resume, Preparing for Interviews, Searching for a Job, Succeeding at Work & More! Education Articles On Learning, K-12 Teaching, Special Education, Language & Instructional Technology - Including Lesson Plans! 2019. brighthub.com. All rights reserved.